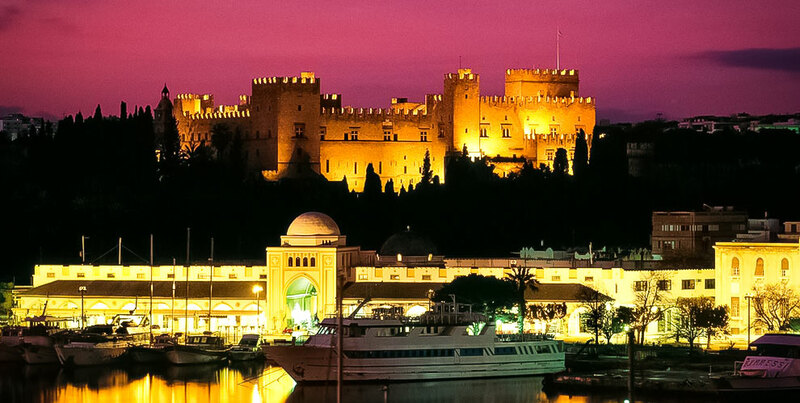 Rhodes (also Rodos or Rhodos – Ρόδος in Greek) is the largest island of Dodecanese and the fourth largest in Greece. Rhodes has brilliant beaches, some of the best in the Mediterranean (Tsambika beach), covered in golden sands leading down to the water’s edge. Many of them are organized with plenty of sun beds and parasols available to hire and offer a significant number of water sports (banana boat rides, jet-skiing, water-skiing, windsurfing, surfing, snorkeling, scuba diving, parasailing, paragliding). The island is one of the top locations in the world for kite and wind surfing. However if you are just looking for a place to relax then you will find a number of quiet beaches, most of them in the southern part, that you can enjoy. The town of Rhodos is located at the most northern point of the island. Mandraki is the town’s old seaport, now mainly used as marina. At its entrance, you can admire the two sculpted deers that stand out and opposite, the old picturesque windmills and Saint Nikolaos’s firehouse. It is believed that this is the place that once stood the famous Colossus of Rhodes. Just 1,5 km from the town center on the hill of Saint Stephanos (or Monte Smith), overlooking the town and the bay of Ixia, lies a marvelous archeological site, the Acropolis of Rhodes with the temple of Apollo and its ancient Stadium. At the top, walkers go by and enjoy the superb sunset blended with the panoramic view of the bay and the city below. Situated approximately five kilometers south east of the village of Theologos (or Tholos), the Valley of the Butterflies (Petaloudes) is one of the most attractive destinations on the island. 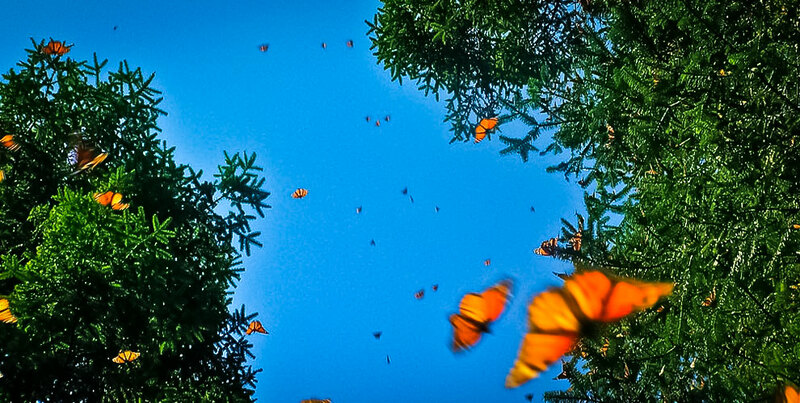 During August, thousands of butterflies of the genus Panaxia (species Quadripunctaria Poda) overwhelm the valley in order to reproduce. 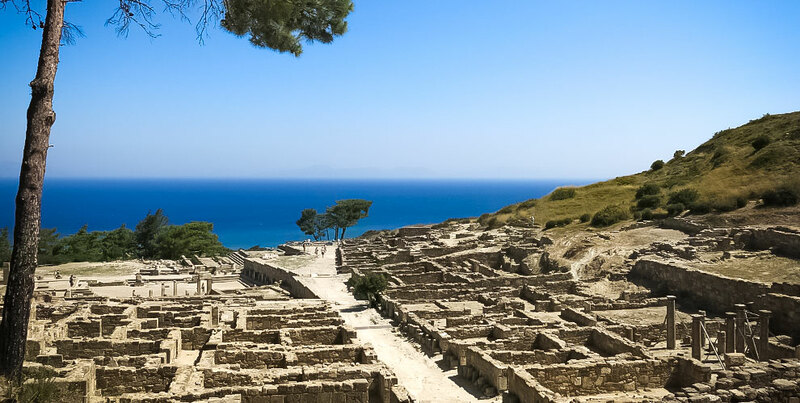 Ialysos is one of the three ancient cities of Rodos with remains of occupation dating back to 3rd millennium BC and also settlements & cemeteries dating from the Mycenaean-Minoan period. The building remains of ancient Ialysos discovered to date are mainly on the Filerimos hill, which was given this name in Byzantine times. Its earliest known name was Achaia, which is further evidence for the presence of Greeks in this area during the Mycenaean period, Strabo calls the hill Ochyroma ('Fortification'). From very early times the hill was in fact used as a strong point and also as a place of worship. During the period of Italian rule (1912-1945) a 'Golgotha' was built: this was a series of shrines with relief scenes of the Passion, which leads from the square to the west edge of the plateau of the Filerimos hill. Also a 30m stone cross was constructed but it was destroyed during the Second World War. In 1996 a 16 metre cross was rebuilted on the top the plateau from which you can enjoy the beautiful view. The scent of pine on every breath, rustic bridges and trickling streams set the mood for 'Epta Piges' (Seven Springs), found 30 km from the City of Rhodes. Those who want to rise to the challenge can wander around the maize of footpaths searching out the source of each of the seven springs. Lying across the entry road, a green lake with turquoise waters nestles in a pine clad gorge. A sign posted footpath leads to it from the main site as does a tunnel carrying a stream. Many visitors walk through the 610ft (186m) long dark tunnel but it is not recommended for claustrophobic, who may follow the signposted alternate route. Peacocks wander the site too and if they are not to be seen their penetrating cry is unlikely to pass unnoticed. Set in some of the deepest shade by the water edge, the taverna (occasional operation during winter) is an atmospheric place to refresh and the food is good too. 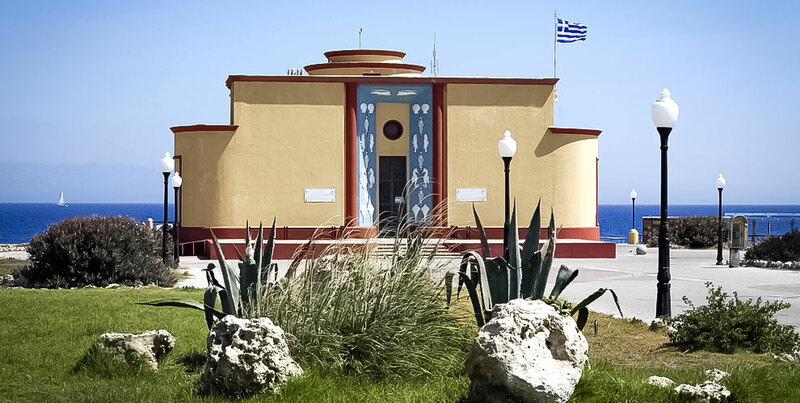 The Hydrobiological Station of Rodos is located in the northern part of the island and was constructed during 1934 - 1936, initiating its activities in 1937. In 1945 it was incorporated as a peripheral station of the Greek Hydrobiological Institute under the supervision of the Athens Academy. Is has been operating as an Aquarium-museum and research unit since 1963. It belongs to the National Centre for Marine Research (NCMR) which is developing its research activities in oceanography, fisheries and inland waters corresponding institutes. The NCMR falls under the supervision of the General Secretariat of Research and Technology belonging to the Ministry of Development. 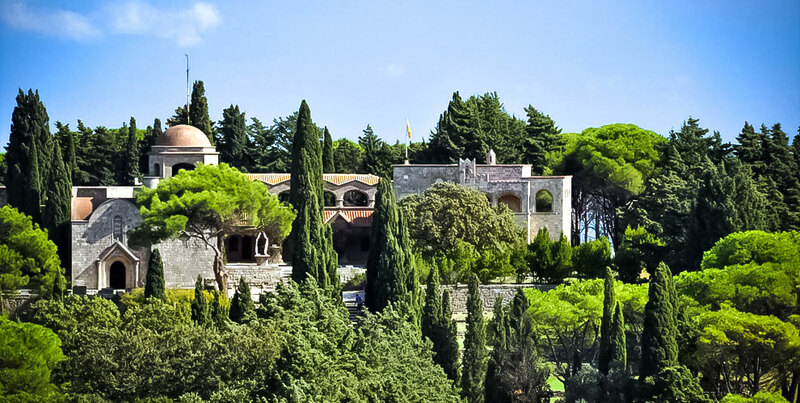 A tiny, Byzantine church, dedicated to Our Lady, located on the top of a hill which offers breathtaking views. The road to Tsambika monastery turns off the main road, some meters before the road to Tsambika beach. The road will take you half way up the hill. After this point, you need to walk up the hill, following 350 steps. 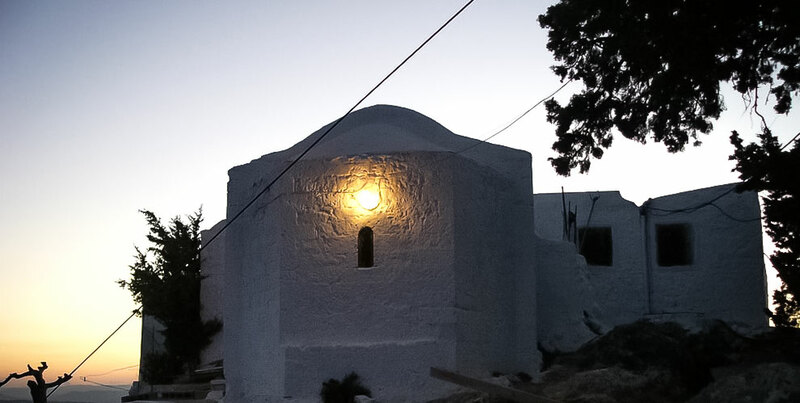 It's perched high at 300 m with commanding coastal views, both north over Kolymbia and south over Tsambika beach until Lindos, which makes it worth, to climb up. According to the legend, any woman having problems getting pregnant should go up there barefoot, to pray to the Virgin and she will be blessed with children. The saint’s day is the 7th of September. Lindos is one of the most impressive archaeological sites in Rhodes. 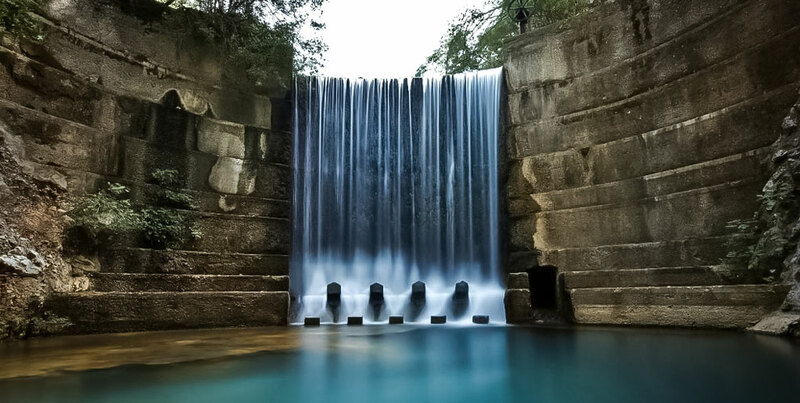 The dramatic natural landscape is enhanced by the picturesque quality of the more modern town. 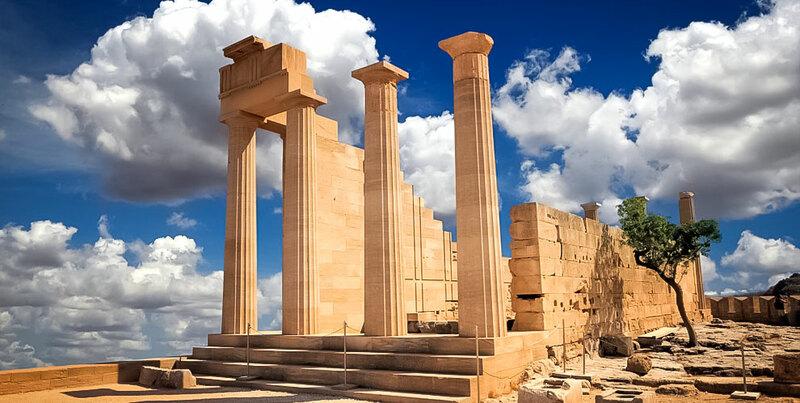 Although you will find the most important archaeological monuments at the acropolis, interesting ruins are also scattered at various points within the town and just outside it as well. To get to the Acropolis follow the road that leads up to the hill. The medieval walls are the first ruins you will encounter, fortifications built by the Crusaders(early 14th century) on the remains of earlier defenses, both Byzantine and ancient. There are a few of towers along the medieval walls, which follow the natural contours of the high ground. The Medieval (or Old) Town of Rhodes is oldest inhabited medieval town in Europe. There are many gates, but we suggest that you first enter through Eleftheria (Liberty) Gate, where you'll come to Plateia Simi (Simi square), containing ruins of the Temple of Venus, identified by the votive offerings found here, which may date from the 3rd century B.C. The Medieval City of Rhodes offers an oportunity to loose track of time. There are roughly 200 streets or lanes that simply have no name. Getting lost here is not a defeat; it's an opportunity. Whenever you feel the need to find your bearings, you can ask for Sokratous, which is the closest the Old Town of Rhodes comes to having a main street. On the north-western shore of Rhodes, close To the promontory of Agios Minas (the Ancient Mylantio) lies the third of The island's ancient cities - Kamiros. amiros was one of the three large Doric cities of the island, which united with Ialyssos and Lindos in the 5th century B.C. to create the powerful city - state of Rhodes. Although it was established by the Dorians, it seems like the first inhabitants of the area must have been Achaeans, as the ruins of an ancient Mycenaean necropolis close to the village of Kalavarda reveal. Kameiros was basically an agricultural society which produced oil, wine and figs. During the city's golden era of the 6th century, it was the first Rhodian city to cut its own coins. Profitis Ilias is a pine-wooded forest named after the Prophet Elias whose monastery is found on the mountain (2.600ft/ 720 m). The two adjacent Swiss Chalet style hotels, Elafos (stag) and Elafina (doe), were built by the Italians but they have actually been closed for a number of years. 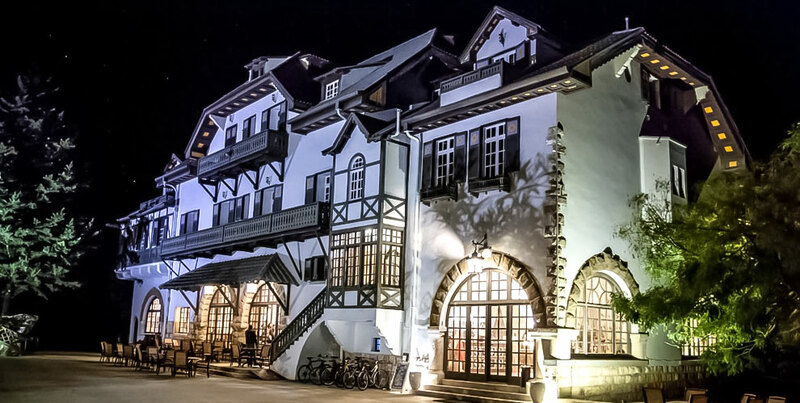 The Elafos Hotel became operational again in 2006 and offers 20 rooms and 3 Suites, while there is a plan to renovate the Elafina too. A nearby café is open for tea, coffee or ouzo nearby the log fire. The walled-in monastery itself is small and shows little signs of life until 20 June, its Saint's day. At this altitude, the wild flowers can be enjoyed and it is possible to see Cyclamen repandum, which is widespread up here, until late May and possibly later in a cool spring. One speciality to look out for which is fairly common here but not in other parts of the island, is the charming, white Paeonia clusii ssp rhodia. It flowers in April and May and can sometimes be seen on the banks overhanging the road. 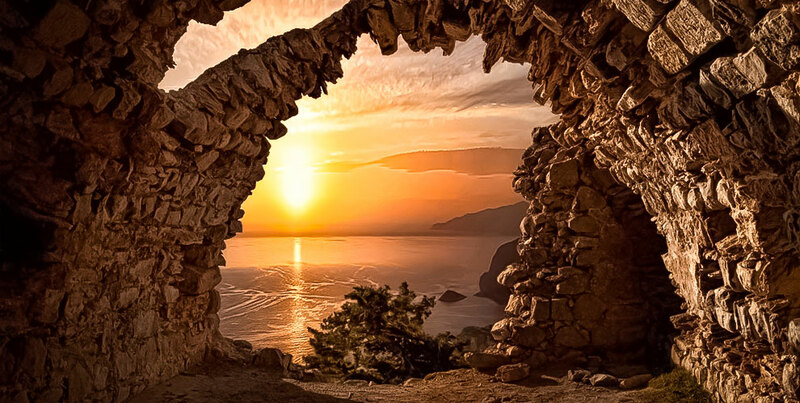 The main attraction of the village of Monolithos is the mediaeval castle, which stands among the pines on the great outcrop of an isolated rock from which the name Monolithos (lonely rock) is derived. After leaving your car at the bottom, there is a a ten-minute walk that will bring you to the summit, where your only company is the sea and the fragrance of the wild herbs. Within the castle walls stands the church of Agios Panteleimon. Bellow the castle you will find an attractive stone building housing a small café. The road leads on to Fourni, the beach at Monolithos, ideal for those who like pebbles, waves and a peaceful setting.